NOMINATED FOR BOTH THE EDGAR AND THE SHAMUS AWARDS FOR BEST FIRST NOVEL OF THE YEAR! Chicago Sun-Times on LITTLE GIRL LOST: "Excellent...[A] machinegun-paced debut...Aleas has done a fine job of capturing both the style and the spirit of the classic detective novel." Baltimore Sun on LITTLE GIRL LOST: "Combine[s] the noir sensibility with emotional depth and superior writing." Publishers Weekly on LITTLE GIRL LOST: "Barrels forth at the speed of [a] Manhattan taxi...and contains some whiplash-inducing plot twists...Tightly written from start to finish, this crime novel is as satisfyingly edgy as the pulp classics that inspired it." 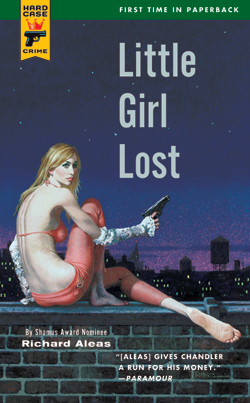 January Magazine on LITTLE GIRL LOST: "[A] slice of pulp heaven." Richard S. Prather on LITTLE GIRL LOST: "A wonderful novel, brilliantly plotted, beautifully written, and completely satisfying." "The most striking first chapter in recent memory...LITTLE GIRL LOST [is] an absolutely terrific read." "Aleas' book is incredibly good." "[Aleas] gives Chandler a run for his money." "[Aleas] is a top-class writer." "[Aleas] succeeds in melding a classic hardboiled missing persons case and something a bit deeper with Little Girl Lost's subtle but intriguing literary undertow." "Able to cut right to the heart of a character or a situation with equal ease, he has a voice as unforgettable as his stories." "A great character with a very original voice. LITTLE GIRL LOST feels both old fashioned and bang up to date at the same time...The Manhattan setting is really well done and the plot fairly clips along in this diverting and exhilarating PI novel." "Little Girl Lost is classic pulp."